Sunset December 7, 2012 16:00 Hrs, more sun to come. As of 06:00 this morning the temperature at 2260 meters was -13, the winds were 0-10 KPH from the WSW. At 1650 meters the temperature was -9.5, 1 cm of new snow was recorded overnight. In the valley it was -5. For the forecast we can expect more sun, some clouds, and a slight possibility of a flurry from the north westerly flow aloft tonight. If you have room for an extra layer and you just returned from an exotic southern vacation put it on. Colder temperatures, so far this season the most fridgid are upon us. The ski conditions are awesome, silky deep snow in places augmented by some great corduroy. A mixed bag for the next few days until the next front arrives on Tuesday. Sunday looks mostly cloudy and Monday should be a mix of sun and cloud. Interesting story, if you are a back country skier you have to realise that your partner is the one going to rescue you , not the St Bernard with the Benedictine. The hazard assessment in the immediate Whistler Area is rated as Moderate, the crust from November 5, 2012 is breaking down with loose rounding facets on both sides of the interface. The crust is present and should be assessed with appropriate diligence. There are always anomalies. Overall the skiing experience on the right exposures is very coastal. From recent observations the surface hoar layer (Nov 28) appears to be a concern in the Duffy Area. I was out in the Spearhead today and here is some of my observations with some images. Tuesday's storm left us with a variety of snow surfaces in the alpine. Ski penetration was on average 10-20 cm, but up to 50cm in some areas. There was also sastrugi and shallow areas where the wind had stripped down to the November crust. We found a few resistant hand shears within density changes in the storm snow down 30-60 cm. 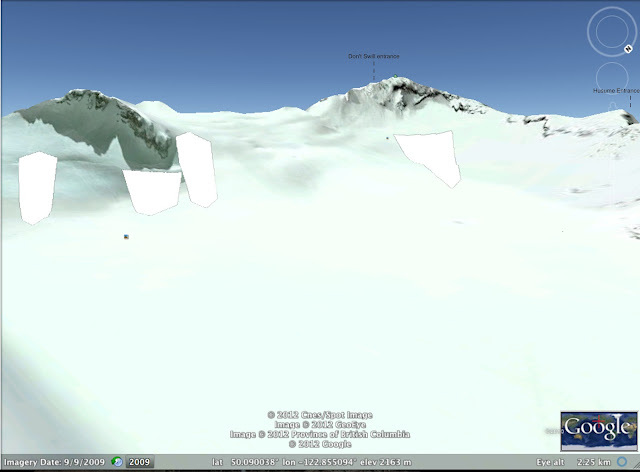 Saw four natural size 2 avalanches on N aspects on the Spearhead Gl. that probably came down during the storm on Tuesday (See Google Earth image). All had crown lines that were over a meter to a meter and a half at their deepest. Visibility was limited so these are approximate numbers. They failed on sharp/steep convex features and have been reloaded. The height of snow on Blackcomb Glacier at 2200m heading up to Spearhead col was 160cm and over 250cm on Spearhead Glacier, but to look at the glaciers in general, coverage appeared low as crevasses are gaping everywhere. 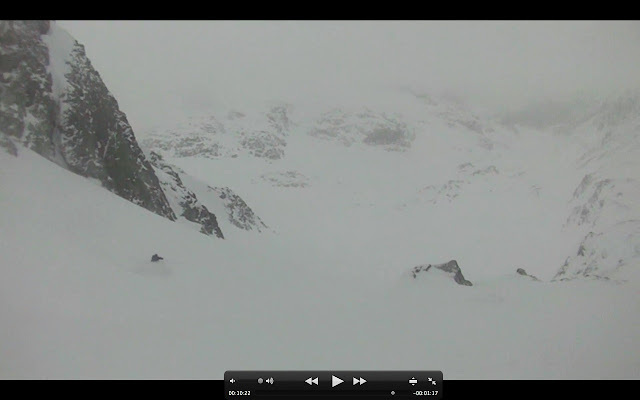 We specifically avoided the skiers right of Blackcomb Glacier to miss a known hole. We saw the weak, sagging bridge from below. Husume had upslope wind pressing it into a soft slab. We travelled through shallow rocky areas with no cracking or whumphing. Overall the visibility was obscured, winds were light to moderate NW and snowing lightly. Temperature was -10 to -14. Google image of old slides. Another sunset shot from Friday night. 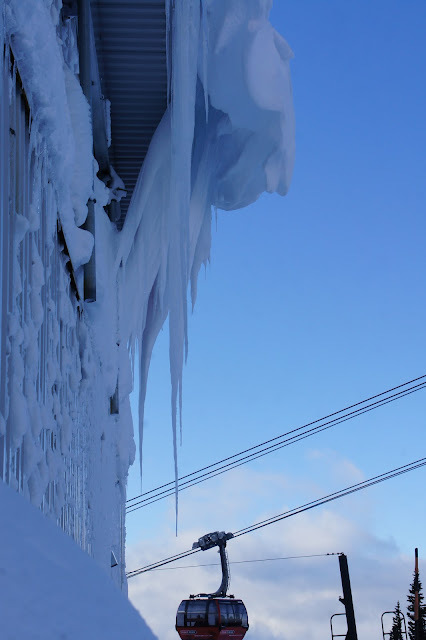 Best avalanche picture submitted by Dec 31, 2012 can win an Arcteryx Tougue and a goggle bag.